An inversion table can be used for fitness, stretching, or both, and you can install one right in your own home! If you’re wondering, “What is the best inversion table?” - We’re here to help. We’ve researched and reviewed some of the best-selling inversion tables around to sort out their features and help you decide! If you’re not sure what you’re looking for, take a peek at our list of specs to consider below before jumping to the reviews! Max. Weight Capacity - Most of the options in our inversion table review list have up to 300 pound capacities, and none lower than 275! Padded Support - Tables with padded backrests can often be more comfortable and supportive, but may limit stretching. Foldable - All of our home inversion table reviews feature foldable tables that make storage and transport a breeze! Adjustable Height - We’ll let you know the range of heights the table can be adjusted to, so anyone can get a perfect fit. Weight - A lighter inversion table is easier to store away between uses, but a higher weight can improve its stability. Dimensions - You probably don’t have unlimited space for a home inversion table, so keep an eye on their full set-up dimensions! It’s time to dig into our best inversion table reviews! Our top pick is hard to beat, while our budget pick offers a great value for a low price. If you want to comparison shop the best inversion table for you, then “stretch” your comfort zone and check out our full list of amazing inversion tables! 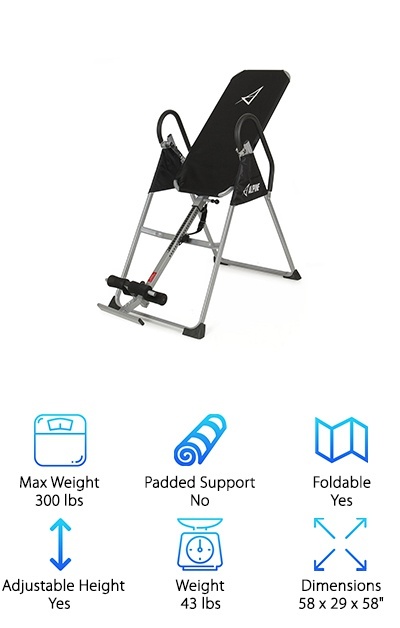 Teeter is a highly rated inversion table brand that you’re probably considering if you want a high-quality, FDA-approved inversion table. Our pick for the best Teeter inversion table is the EP-560, which comes with a five-year full warranty and a DVD to help you learn how to use it! Plus, it arrives mostly pre-assembled to save you time and effort. With this Teeter table, you invert to your desired angle by raising your arms over your head, with the safety strap set to limit your inversion degree. The patented wrap-around foam ankle cups provide a fully secure and comfortable fit. The Comfortrak Bed is contoured and flexes for support and full stretching. Other features like auto-locking hinges, cam locks, and specialized pivot bearings improve the durability and stability of this inversion table. Teeter inversion tables come highly recommended for beginners to experienced users and are incredibly high-quality--making them a great investment for your back! Our budget pick for the best inversion table for the money is the Gracelove Inversion Table. 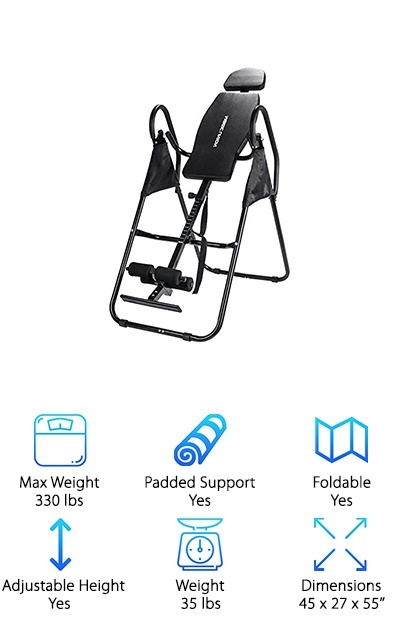 For a low price, you get a sturdy inversion table with extensive height adjustments (from 4’10’’ to 6’6’’) and a high weight capacity of up to 300 pounds! Long padded handles are easy to grab and make righting yourself easy every time. The table features a three-position roller hinge for controlled rotation and an adjustable strap to pre-set how far you want to invert. The heavy-duty steel frame folds up for easy storage when not in use. One tradeoff of a budget inversion table is less padding: this table has a nylon canvas backrest with nylon hinge covers. The padded ankle clamps and foam rollers keep you in place while you invert. If you’re new to inversion tables, a more padded option with greater angle control may be easier for you to get the hang of. 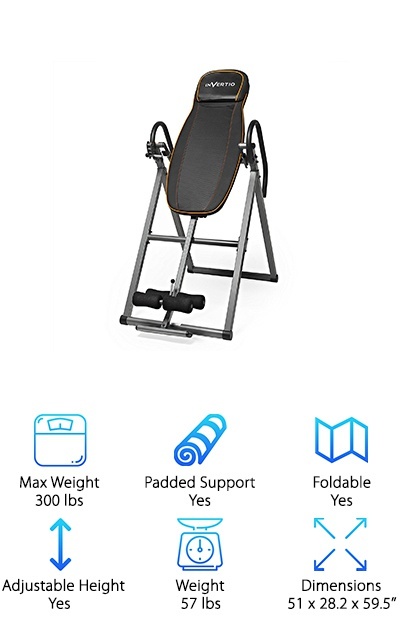 The Exerpeutic Inversion Table starts off strong with a foldable 1.5’’ square steel frame and .75’’ thick foam backrest padding. Contoured ankle cushions and foam rollers keep your ankles in place and provide support, and you can step in and out of them quickly with the pull-pin release. This table uses an adjustable tether strap lets you choose your inversion angle before settling in, and you can fully invert up to 180 degrees! However, if you want to invert to an exact degree level, you may prefer a table design with pre-marked angles. The table is height adjustable for people 4’10’’ to 6’6’’, and has a weight capacity of up to 300 pounds. This ensures that multiple users can use the table comfortably! 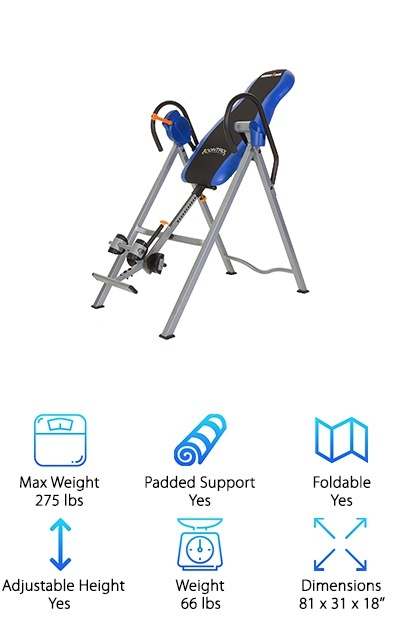 If you want a basic budget inversion table that’s still padded and comfortable to use, the Exerpeutic Inversion Table has a great value! The Akonza Inversion Table is a basic system that’s great for exercises like inverted crunches as well as stretching out your back. 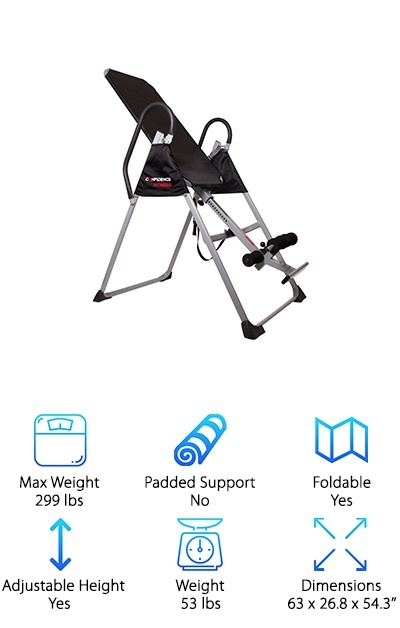 The heavy-duty non-rocking steel frame supports weights up to 300 pounds, and has non-skid composite feet for extra stability and to protect flooring. This table uses a nylon canvas backrest rather than foam padding. Padded handrails are easy to grab when you want to right yourself, and nylon covers keep your fingers separate from the pivot hinges. The foam roller ankle clamps can be adjusted for a secure fit, and the whole contraption folds up almost completely flat to make storage a cinch. Pre-set the inversion angle you want with the limiting strap without worrying about rocking, wobbling, or going further than you’re comfortable with! The table can be adjusted to fit people 4’10’’ to 6’5’’, which is another great feature on top of the high weight capacity to add versatility. 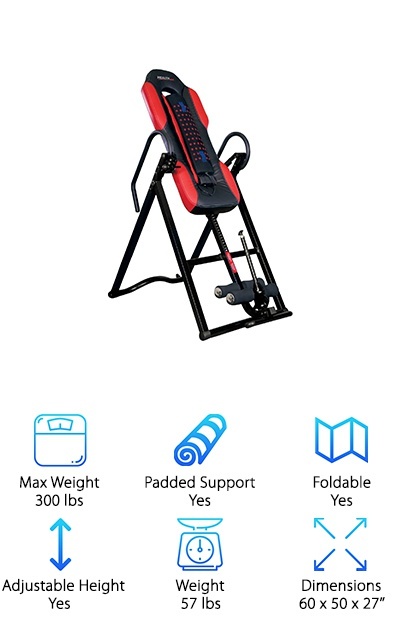 If you’ve been looking for Ironman inversion table reviews, you definitely have to consider the Ironman iControl 400 Inversion Table. This table has a 1.5’’ padded backrest with an integrated headrest for full support, and the contoured padded ankle holders ensure a secure but comfortable fit. This Ironman inversion table did away with the strap system in favor of the iControl Disk Brake system. You can adjust to the exact angle you want and lock the table at that angle if you want to do exercises without wobbling. Lock the table at mount and dismount as well for total stability! No more free-fall! Make use of the included “stretching bar” to fully stretch your back muscles. The table can be adjusted for heights from 4’10’’ to 6’6’’ to suit a wide range of body types and sizes. This is a great inversion table for fitness uses as well as for inversion therapy. The Invertio Adjustable Table has a smart and sturdy design packed into a foldable heavy-duty steel frame. The backrest and headrest are well-padded. The foam roller ankle supports can be adjusted to eight different positions for the perfect fit. Instead of a strap system, this table uses a bolt design so you can pre-set your desired inversion angle--no wobbling involved! Non-skid feet keep the table in place without marking up your floors, and the whole thing folds almost completely flat to store away under the bed or in a closet. Adjust it for heights from 5’1’’ to 6’6’’. Extra-long handrails are another great feature that help you get in your selected inverted position and back up again without a fight. It has a weight capacity of up to 300 pounds thanks to its sturdy design. 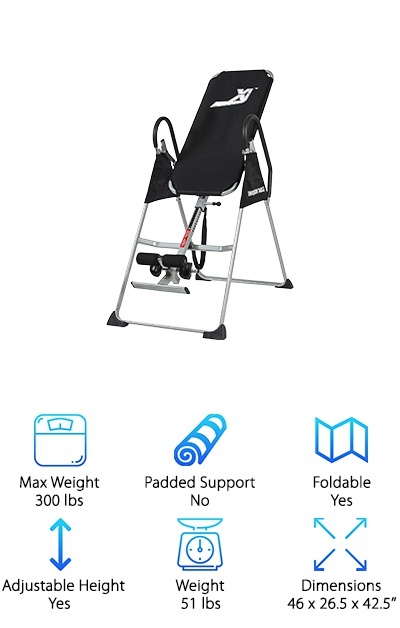 If you’re looking for an inversion table that doesn’t use the strap system, you should definitely consider this option from Invertio! The Health Gear Inversion Table was a must-have pick for our inversion table reviews due to its full-featured design! People from 5’1’’ to 6’5’’ and up to 300 pounds can use it comfortably. The highly padded foam backrest uses three inches of foam to totally cushion and support your body. They didn’t skimp on padding around the ankles, either, with adjustable over-sized padded foam rollers helping you avoid pinches as you invert. Use the side inversion pin to easily select 20, 40, or 60-degree inversion positions quickly. The extra-long ankle clamp post is a great feature for people with sore backs, since you don’t have to bend over to lock or unlock your ankles. On top of all that, a deluxe heat and massage pad is included for portable vibrating massage therapy! 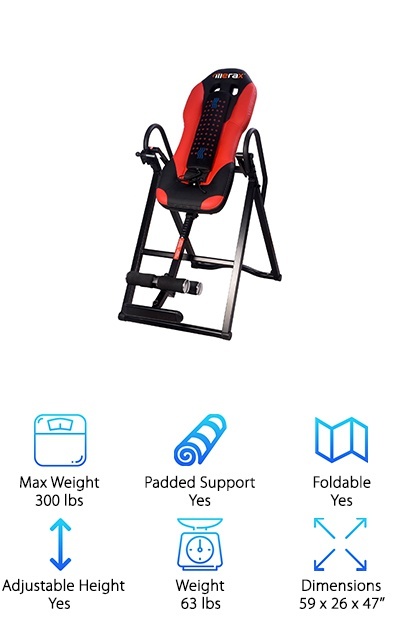 Attach it to the inversion table or watch TV with it, and make adjustments in seconds with the controller. The Confidence Fitness Inversion Table keeps it simple with a minimally padded backrest over a durable steel frame. If you’re looking for a best rated inversion table with extensive height adjustment options, you’ll appreciate the height accommodation of this table for people 4’10’’ to 6’6’’. If you have multiple people in your household who want to make use of inversion therapy, the odds are good that this table will fit them! The frame has side covers to protect the moving joints as you invert, keeping your fingers out of the way. This inversion table supports up to 299 pounds and weighs 53 pounds. You can fold it up and hide it away between uses or easily transport it from place to place. Some people prefer a greater amount of padding on the backrest for more support, or more secure ankle padding options. Overall, it’s a great budget inversion table! 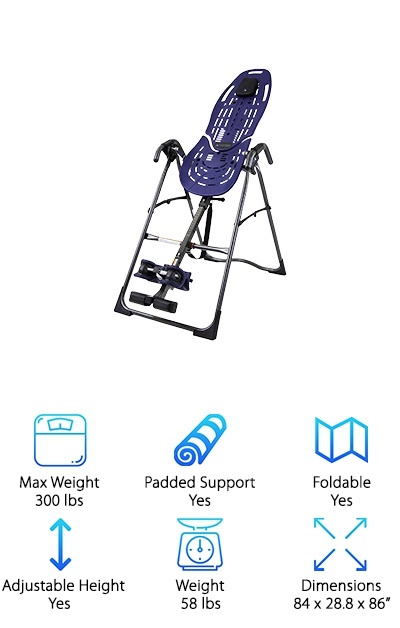 The Action Club Inversion Table supports up to 330 pounds and is height-adjustable for people from 5’1’’ to 6’6’’! Although not as heavily padded as some inversion tables, this top rated inversion table still made our list due to its solid design.The heavy-duty powder-coated steel frame folds up for storage between uses, and you’ll rest against a comfortable padded PU leather cushion with soft foam rollers holding your ankles. Non-skid feet keep it in place while you’re getting settled. This table can provide up to 180 degrees of full inversion! Just use the padded anti-slip handle and adjustable tether strap to adjust your inversion or return to the upright position. Despite its high weight capacity, the actual weight of the table is 35 pounds, so it’s easy to put away or transport. Especially if you’re on the taller end of the height spectrum, you’ll enjoy using this table for your inversion sessions! The Merax Inversion Table doesn’t just invert: it provides vibrating massage and heat therapy, and it’s padded with high-density foam for total comfort! The heated vibrating massager section can be removed depending on the user’s preference. You can adjust this table to fit heights from 4’10’’ to 6’3’’, and it supports up to 300 pounds! When the session is finished, you can fold it up to store it away or take it with you. The steel frame provides a sturdy base of support, while adjustable oversized foam rollers provide a secure fit around the ankles. The pivot arm gives you total control over how the table moves. You can use it by yourself: once you’re locked into the ankle supports, stretch your arms over your head to gradually tilt the table and invert yourself. If you’re looking for an inversion table with additional beneficial therapies, the vibrating massage and heat can help you relax even further while you invert.